Sometimes a product solution is simple and straight forward. The KeySure KeyController is a stand alone product that works on the concept that the there can be no secret use of a product. Once you've snapped the box shut, you have to break it to open it. No reuse. No use without your knowledge. 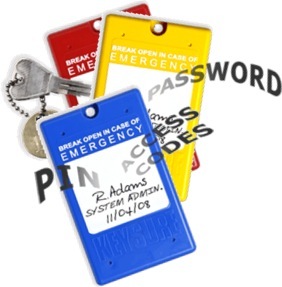 Use for emergency access to keys, cards, passwords, combinations...anything that you want only verified use of. 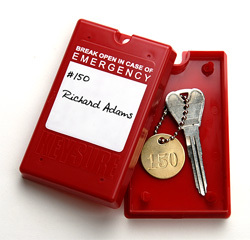 KeySure's KeyController prevents keys and other secure items from being used surreptitiously. It's about maintaining control, internal security, accountability. Simplicity, non-electric, lightweight, portable, inexpensive, foolproof. Once closed, it must be broken to access the contents. How Can I leave a key with someone and have accountability for that key? Who's using the KeySure KeyController? External Dimensions: 3.0" x 4.75" x 0.75"
Internal Dimensions: 2.5" x 3.5" x 0.5"